Delivering secure business file sharing is our top priority, and today we are happy to roll out Session Timeouts and Revoke Access features that give you greater control over who can access the files you store on Onehub. Session Timeout is an account level setting that allows account administrators to specify the length of time that a user can remain signed in to Onehub. For instance, you can set your account Session Timeout to 7 days so that, every 7 days, your users will automatically be signed out of Onehub. Alternatively, you could set your account Session Timeout to 15 minutes so that users will automatically be signed out after 15 minutes of inactivity. Enforcing account Session Timeouts gives you tighter data security. If a user forgets to sign out of Onehub and leaves their computer, shorter session timeouts will deny access to your files to anyone on that computer until the user actively signs in again. Setting up Session Timeouts is easy for any account administrator. 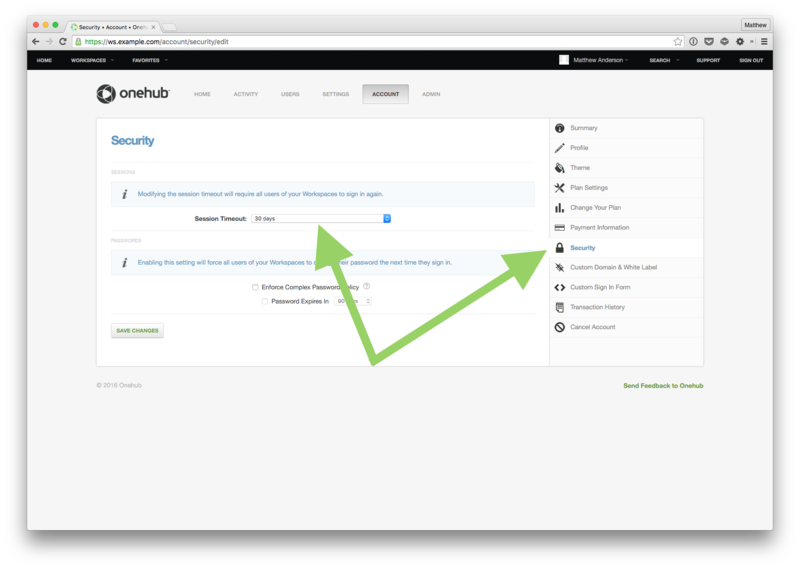 Just sign into Onehub, click the Account button, and click the Security tab. Here you will find a Sessions section with a drop-down menu of available timeout options. Select the timeout that best suits your business and click ‘Save Changes’. The new Revoke Access feature gives you a detailed account of the sessions, devices, and apps currently connected to your Onehub account. With Revoke Access you can immediately shut off these connections to your account. Revoke Access can be found by clicking “Settings” and then clicking the “Security” tab. This will display all the various connections to your Onehub Account and give you the option to revoke them. And this is just the beginning. We’ll be rolling out additional security features in the coming weeks, so stay tuned. In the meantime, if you have any questions about activating or using either Session Timeouts or Revoke Access, check out this support article for more details. 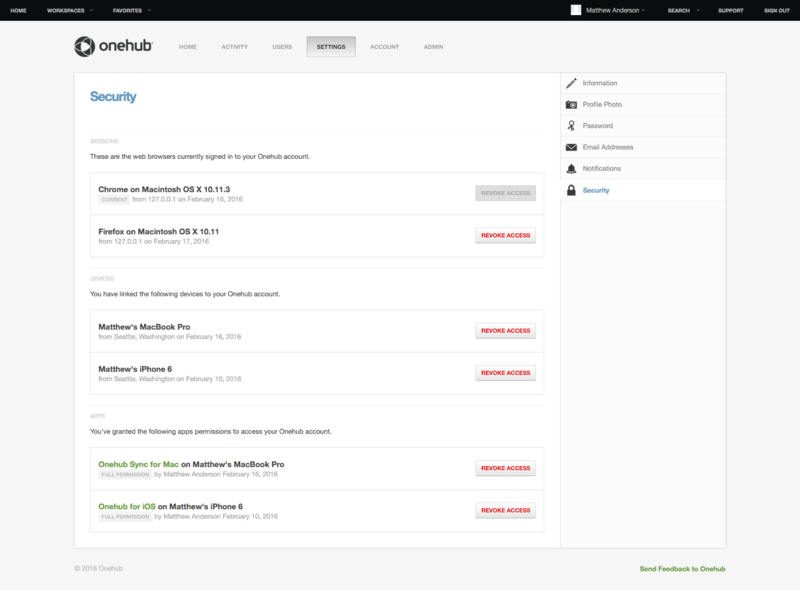 For more information about how Onehub protects your data, check out our Security page. This entry was posted in Product and tagged Revoke Access, Session Timeout by Chris Albrecht. Bookmark the permalink. Event Notifications in Rails 5 with ActionCable!